The 3rd book in line for book review was this – Kana’s Standard by Kana Sato. This book was first published in 2015 February. That was when I was preoccupied with my new baby and was too exhausted to think about any sewing, much less buying new books 🙂 But this book kept popping up on Instagram, and the clothes look so comfortable and stylish that I knew I had to get a copy of my own. Since then the author has published a second book Kana’s Standard II plus 2 kids books (I have reviewed one here before), and I’m only getting acquainted with her first! No worries, second book has been ordered and on the way! Let’s take a look at the contents of this book. There are 24 different projects for co-ordinates that you can mix and match, actual styling examples for your reference. The number “70” on the cover refers to the number of styles example shown in the book. This book is for ladies sizes 7,9,11,13. These are Japanese sizes of course. The most confusing thing about this book was the lack of a real size chart. I think those of you who have bought this book may have wondered about it. I will be translating the size info page further down the review, so I hope that will help! But first things first, lets look at the pretty clothes! The first top is the one on the front cover. It’s really quite a standard pullover top design, but the frills detail on the sleeve elevated the simple top into a whole new level doesn’t it? An extension of the same top into a dress length, minus the frills and added hidden pockets. A different take on the sleeves. A different fabric, with an added sash and sleeve variation. At the end of each section, there is a styling guide that gives you inspiration for how to co-ordinate these pieces for everyday life. Section B is all about Pants. These were simply called “White Pants” in the book. 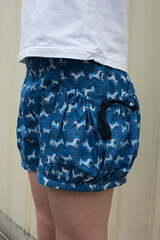 Baggy casual style with no fasteners/zips. Wool pants in 3/4 length. 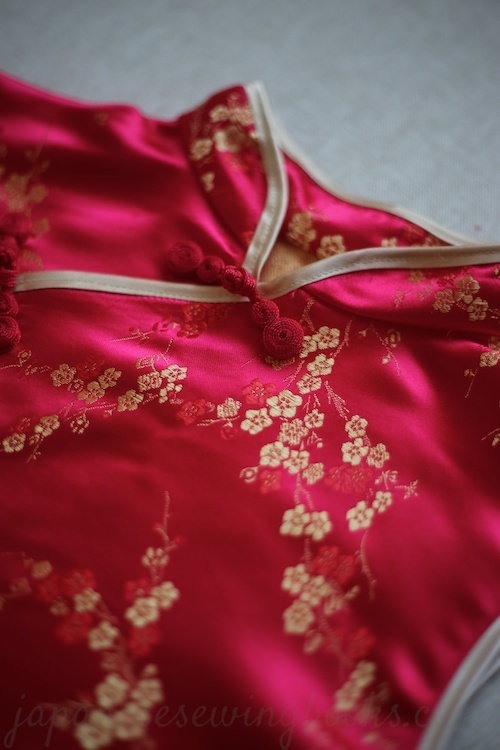 There are two camisole patterns. A longer dress version and a short top version – both are great for layering. The last section is for outerwear, or Gowns. This is a gown made using double gauze. I don’t think it will really keep you warm but it’s great for layering on cooler days. I love the casual unstructured look of double gauze too, plus it is so soft and cozy to be in. For even cooler days, make one out of wool. Now for some important information. I was looking high and low for the size chart and couldn’t find it. Then I realized that the information was written out on the intro page of the how-to-make section. There are different points to note for each different section which I suppose is the reason why there is no standard size chart. However, the book follows the standard Japanese sizes 7,9,11 and 13. To help you in deciding the correct size to make, I will roughly translate the above information. Note that the translation is not word for word but also includes my own explanations in italics which hopefully will make it clearer. The patterns are free size in a relaxed style. The necklines are larger than head measurements so they can be worn as it is. You can adjust the length of the dresses to your liking. Take note to adjust the belt and ribbon lengths as well. 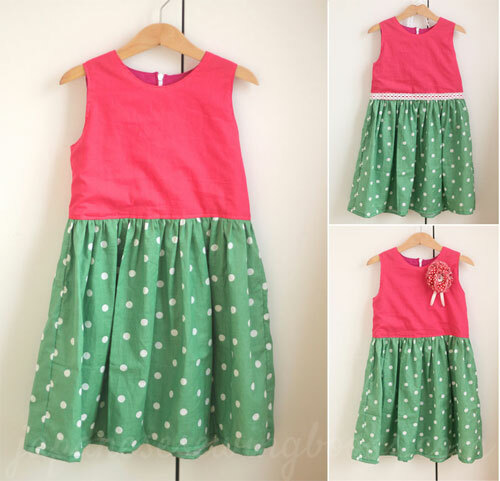 The patterns are available in 4 standard sizes 7,9,11 and 13. Refer to the finished dimensions on each project, there are two dimensions listed for finished dimension 出来上り寸法 . The first is waist ウエスト. The second is ウエスト(最大） which means the waist measurement at its largest/ when the pants are stretched (since these pants have no zips and are elasticized). If your own hip measurement is larger this stretched waist measurement, then you won’t be able to pull the pants over your hip. So it is recommended to choose the size based on the hip size rather than waist size. Only the front belt comes in 4 sizes (7,9,11,13) (this is only for skirts with a flat front waistband and elastic waistband only for the back). For the rest of the skirts that have full elastic waistband, the patterns to be cut are the same, but the length of elastic to use is different. Similar to the pants, remember to select the size based on hip size rather than waist size. This is a free size pattern. The finished bust circumference is about 97cm. If your actual bust is larger than that, you can widen it from the centre fold line for both front and back patterns. If it is smaller, you can narrow the pattern by cutting the pattern from the centre fold line as well. There is only one size for the front and back pieces. But there are 2 sizes for the sleeves – 9 and 13. My (not me! but the pattern designer who is also the model in the book) height is 165cm, and usually wear a size 9. The shown pieces are made using size 9 patterns. Also take note that the cutting diagrams are based on size 9 patterns. If you are making larger sizes or prints that need to be matched, you may need to use more fabric than recommended. So please double check before buying your fabric. Sample of the how-to-make page. 2 full size double sided pattern sheets. This book is also available on Amazon marketplace. Click on the link to find your buying options. I had a list of book reviews lined up, but this new release (just last week!) 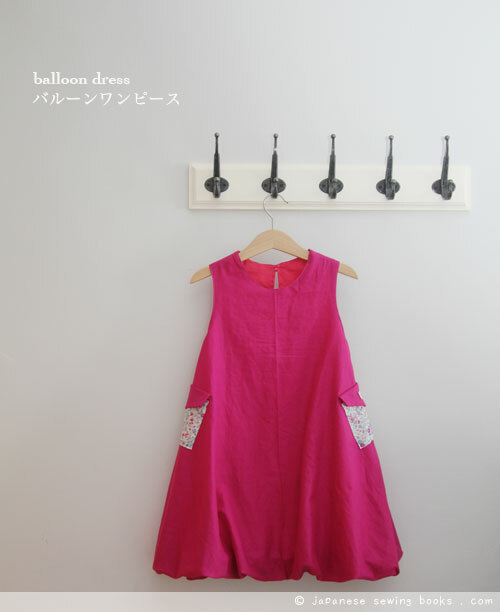 from my favourite pattern designer Yukari Nakano of Couturier Sewing Class, just needed to be reviewed first. So those of you who were waiting for the rest of the books please be patient with me. I will get back to the list soon. The clothes in this book are designed around the theme of “going out”, whether it is just a simple lunch with friends, or a trip to the museum, the clothes are designed to take you to places. With the combination of simple designs and a focus on using quality materials, the designs will look elegant and sophisticated. What I love most is how quickly and simply most of them could be made, and yet it looks so elegant. Enough said, I know many of you want to dive into the book. Here goes! There are 28 projects to be made from this book. Including tops, dresses, skirts, pants, outerwear,even an apron and a bag. There are patterns for both knits and wovens too. It won’t be possible to show all 28 pieces here, so I’ll just show you a few of my favourite ones that have gone straight to my to-do list. Don’t worry, you can browse through the book flip through video at the end of the review. The first is a stand collar blouse. This blouse is not only pretty but also very easy to make. There is no button/zip required as the opening in the front allows the blouse to be pulled over the neck. So this top is to be blamed for this review being one day later than it should have been. I was uploading the video and photos and just felt the itch to stitch. It looked so easy and quick to make so I decided to just do it. Only two pieces of patterns required, and I even managed to do it with my 2yr old trying to run over my drafting paper, transferred it to fabric (did you know her patterns include the seam allowance already so that cut down some time too! ), cut it out and in between cooking, I sewed it up! This is another variation of the same blouse, – which by the way is called the Slit Pullover. The name comes from the fact that the armholes are actually like slits in the drop shoulder seam. This is another garment I would like to make another day. The 2 way V neck tunic. I have made 2 of her V-neck pullover blouses before and they are currently staples in my wardrobe. They are so quick and fast to make and the neckline is flattering as well. But my favourite detail for this tunic is in the button up sleeves. This is the back view for the High Neck Ribbon Blouse – which is also the blouse on the cover of the book. Love the neck line, the flared sleeves and the ribbon detail. 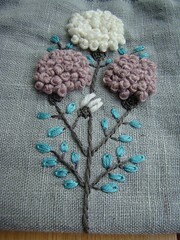 Another on my itch to stitch list, and I think this might be next to be made. The Raglan sleeve pullover. I am currently watching Tokyo Tarareba Musume (a Japanese drama) and just so happens the the female lead was wearing a top with this type of neckline! This looks quite similar to the top on the cover of her previous book but on closer inspection it is a different design altogether. In this case the sleeves are separate pieces and quite similar to the construction of a raglan tee, but with a high neckline. 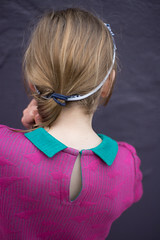 A simple white peplum blouse with a semi exposed metal zip on the back. So simple and elegant. The fabric looks like a jacquard print but I can’t be sure because it just says “cotton” in the instructions. There is a full sewing lesson with step by step photos for this particular blouse. A Peplum Jacket, makes a casual outfit dressier, yet not too formal looking. I love coats, I wish I could make them but there’s no where I can wear them to in hot and sunny Singapore. I’ll just have to drool at them. This coat is simply called the Gown Coat. I see a lot of them being worn nowadays in Japanese/Korean dramas as well. So it must be the trend! I just think it looks so lush and cozy! Ok, now for the technicalities as usual. The above is the size chart for this book. Patterns for sizes S-LL. The Japanese terms on the left column are Heigh / Bust / Waist / Hip respectively. There are 2 detailed sewing lessons, plus a few extra bonus pages of sewing tips (with pictures). The detailed sewing lessons are for the white Peplum blouse as well as the Slit pullover. Just a close up of the photo instructions in the sewing lesson. Sorry for the blur photo. My son was trying to push me away from the table while I was finishing up, so yup, hand-shake. But this photo was just to show you the standard how-to-make looks like for the rest of the projects that do not have the sewing lesson. 2 full size, double sided pattern sheets. Do note that for her patterns, seam allowances are included already! I know you haven’t seen enough of the book, so here is the full book flip through review. Based on the last poll on books you would like me to read, this book came out second! The title of the book is Everyday Ruck(sacks). The characters “リュック” is literally translated to Ruck instead of the full word rucksack, but the Japanese have shortened it to Ruck and it’s understood that it means a rucksack / backpack. Featured on the cover is the popular backpack style with the wire frame opening, which allows it to open fully and stay open while you dig through your backpack for stuff. Let’s take look at the different rucksacks / backpack sewing patterns you can make with this book. The first pattern is the wire frame rucksack / backpack sewing pattern as featured on the front cover. See in the bottom right picture how it opens up big and wide which makes it easy to find your stuff. This is a cute Tote style backpack with a simple zip opening on the top. The standard backpack sewing pattern. This is available in kids size as well as adult size versions. The kids size version is 32cm(H) x 23cm(W) x 12cm (D) while the adult size is 40cm(H) x 28cm(W) x 1cm(D). This pattern comes with a detailed sewing lesson. Who said backpacks have to look sporty or rugged, here’s a cute kisslock purse frame bag. This is a convertible backpack / messenger bag, made using digitally printed basket weave fabric. I’m not a big fan of these digitally printed textures but it does look like a basket weave bag from far doesn’t it? I really like this idea! and I learned a new phrase while looking this up. This back is called the レジかご　リュック。 The first term レジかご (rejikago) actually means checkout while the second term means rucksack. So this is a bag designed to fit into a shopping basket, and you can carry your groceries in it after payment. There are lots of such bags available for sale online but mostly in tote bag style. This is one that converts to a rucksack/backpack that allows you to carry it on your shoulders. Another interesting convertible bag. This converts from shoulder bag that can be carried messenger/crossbody style, or backpack style. The unique feature of this bag is how the backpack straps are zipped together to form one wider strap for the shoulder bag. Seems like a great idea for a travel or diaper bag. This is not a rucksack / backpack sewing pattern, but rather a in-bag organizer for you to sort out all the small items that tend to disappear in the depths of your backpack. It will help to keep things upright as well! There is a full, step by step photo tutorial for the making of the basic rucksack / backpack sewing pattern. Here is an example for the other bag patterns’ instructions. I did feel that the instructions were a little brief for certain steps, and when it comes to bag making, so many of the parts look similar (for example rectangular pieces) and it takes a while to decipher the instructions. 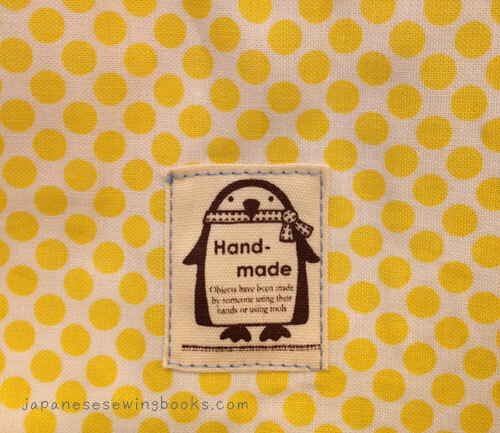 You may also need to translate some of the text to tell which part of the bag you are making too. A close up of the diagrams. In summary, if you want to learn how to make a standard rucksack / backpack from scratch, the detailed sewing lesson will be a great resource. However, for the rest of the patterns, they are not that simple to sew so it may not be ideal for a beginner sewist. However, if you are quite adept at sewing bags, you will love this book because I found many new creative ideas for convertible bags in here. For the rest of the bag patterns not shown above, here’s my book flip-through review! Happy browsing! Subscribe to my YouTube Channel for more book reviews and sewing tutorials! Thanks for voting! I held a poll on my FB and Instagram pages, to help me decide which books to review next, since I have quite a few lined up and I just couldn’t decide. Turns out that this came out tops! No wonder, as it is the latest book by Yukari Nakano – the author of Sewing Couturier Class books (read the previous two book reviews here – Daily wear for Ladies and Good Clothes for Ladies) This book was actually released last October but I only bought it a few months ago. She has a new book coming out in August and I will be sure to get that as soon as I can! 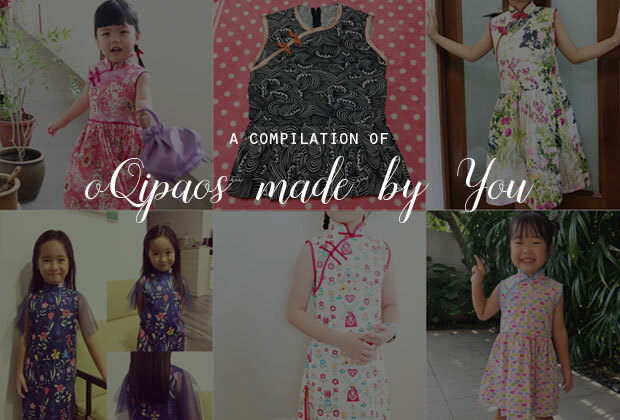 The title is loosely translated to – Japanese Easy Fashionable Ladies Wear to make. You can see the words “Easy Sewing” on the top. The patterns included are all easy to make, with few pattern pieces and easy finishes. No zips/buttons! There are 6 basic patterns, from which 27 different variations can be made. Sizes included – S,M,L. There are 4 pattern sheets included. The first project is a Gathered Skirt, and the basic version is as simple as can be. No pattern tracing required even! Just two rectangles and an elastic waistband. 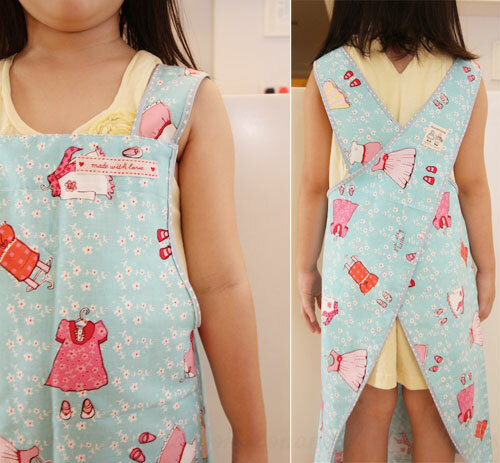 A fully detailed sewing lesson, complete with step by step photographs is available for this project. It is a great project for beginners and a real confidence booster as well. Once you have mastered the basic gathered skirt, you can move on to make more interesting ones like this one above which has the fabric cut on the bias. Or this reversible skirt with lace and cotton lawn. The next basic design B – is a tight skirt. It is quite similar to the gathered skirt in the construction, 2 pieces of fabrics and an elastic waistband. The variations include side pockets, back pockets and back slits. However, do note that in order to achieve a tight skirt without a zip/opening, the skirts are all made of knit/jersey material. The designer used different types of knit – acrylic knit, wool knit, polyester stretch, for the different skirts to make it simple to sew but fitting to the body. HOWEVER, just a warning if you are a beginner. I was looking for notes on how to sew on knit material, since it is quite different from sewing wovens/non-stretch fabrics), but there was none! Sewing with knits is slightly different from sewing with wovens. It is not as scary as some make it out to be, but it does require different needles, knowing the right stitches to use, and also some practice before you can make it look as good as it does in the book. 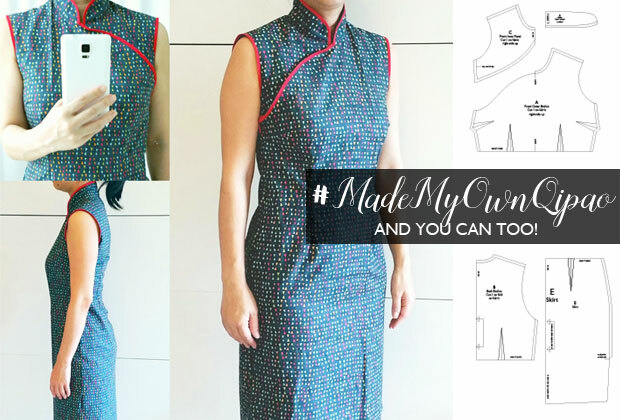 If you already know how to sew with knits with either a serger or a sewing machine, then I think these patterns are quite nice and simple to use and also perfectly wearable. But like I said, if you are just starting out, you may find it frustrating if you try to sew it the same way as wovens. You may find your stitches popping out after a while because they are not meant to stretch. Pattern D is a Bottleneck Dress. I think from the picture above it is quite easy to tell what is meant by bottleneck dress. As you can see the neck hole is very small, and guess what, there are no zips/buttons too, which makes it a easy sew. However, the only way for the head to get in and out of the dress is if…. 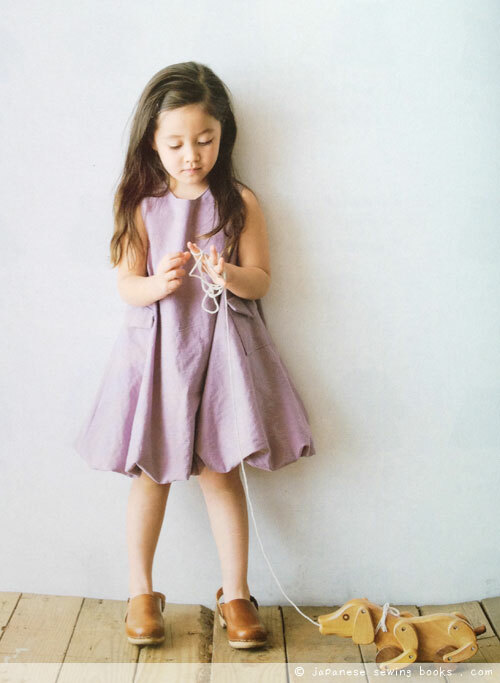 the dress was made of knit fabric so that it will stretch. So the same problem applies to this set of patterns as the tight skirt. You need to learn/know how to sew with knits and the book doesn’t tell you how. 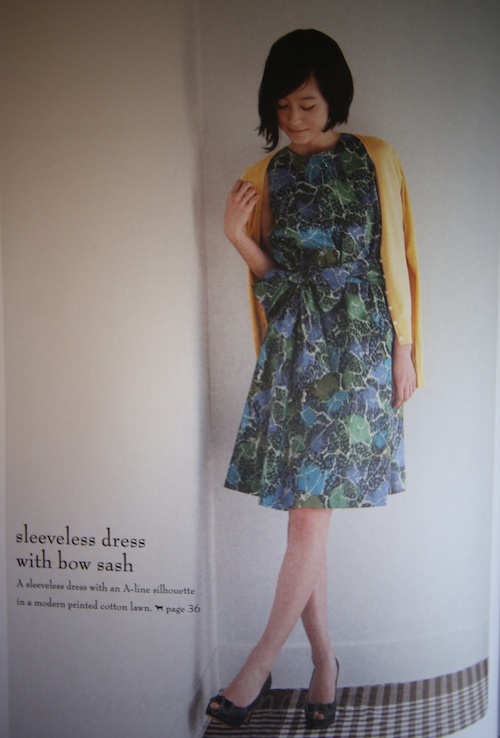 I did, however, find a small picture in one of the how-to-make sections for this particular dress (above), recommending some stretch thread and stretch needles that will go best with the wool knit. But it’s just a small picture and easily missed. This is the bottleneck top as shown on the cover of the book, it is just a shorter variation of the bottleneck dress but with a belt sash. Pattern E is for a dropped shoulder dress. This is an easy sew with no zips/buttons too, and the neck hole is large enough to pull it over, so you can use wovens for this. This is probably the most interesting piece as there are length variations – long (Dress), short (top), with sleeve length variations as well. I like this one which uses cotton lace/eyelet for the sleeves and plain white fabric. The last pattern is a margaret. I don’t know if this is the official English name for it but this is how it is spelled in the book. It is like a long rectangular piece of fabric with parts of the short ends sewn up, leaving holes for the arms to go through. It’s like a coverup/cardigan. The variations in the book are mainly combinations of different fabric. Wool knits are used here as well, but as the garment is loose and does not really require stretching of the fabric to get in and out of, I think it is possible to use normal stitches here. Some ideas for styling using the pieces made in the book. There are two sewing lessons in the book. The first is the gathered skirt, and the second is the drop shoulder dress. A close up of the instructions. Most of the patterns’ how-to-make are in the above format. It is rather simple compared to a lot of other books I have used. But as mentioned before, this book is all about simple patterns with very simple techniques. Most of which are covered within the 2 detailed sewing lessons. Also, as many of the patterns are variations, there will be references to the main pattern or other similar patterns, like the top above, steps 1-5 is based on the main pattern’s instructions on pg 37-39.
and here’s the book flip-through video! Remember the book review I wrote a couple of weeks ago? I made one of the tops and wanted to show you the results. I made this top A3, but instead of using eyelet/lace fabric for the frills, I used the same fabric throughout. I also sized down as I was going to make it out of knit fabric. This was the actual top. I made size M when the size chart said I should make L, that’s because when making tops out of knit fabric, expect a lot more ease due to the stretching of the fabric. However, I still found it too baggy for my liking. In the photo from the book, the lady wears it tucked into pants, so the waistline is defined by the waistband, and therefore it doesn’t look so waistless. I will bear that in mind when coordinating with bottoms. Although tucking in shirts is not really my thing. Here’s a back view of the sleeves. Can you tell that there is no separate sleeve piece? There is some bagginess in the underarm area because of that, but also because I think this size is too large for me. However, it is really comfortable to wear and allows for lots of movement, something that I really need in daily wear because of my super wriggly toddler.